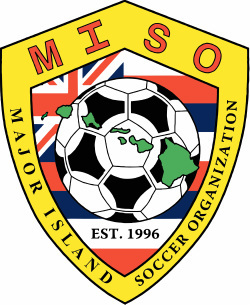 Welcome to the official site of Major Island Soccer Organization (MISO) We hope you find this site informative and entertaining. After a year's term, Cesar Robledo decided to step down as President and the Board elected Sergio Bolioli as its new President and Mark Robinson as VP. The League went through some growing pains, but has since incorporated many changes, including a play-off format and multiple Divisions, making it more exciting for players, teams and fans. MISO has strengthened its roots, and is now looking bright for the future, with the expansion of teams and strength in competition. After just fifteen (15) years of existence, it is now considered by most, as the premier adult league in the state of Hawaii. In March of 2001, MISO introduced the Masters Division (45+), composed of players still seeking a challenge but too old to compete in the Open Division. Later, in the Spring of 2002, MISO split its Open Division to create a Division I and a Division II, with promotion and relegation, making all the games more competitive. Along with the introduction of multiple Divisions, the MISO Open "Robledo" Cup was created, which involves both Divisions competing for a same crown. In September of 2001, MISO introduced the MISO Junior League (MJL), which focuses on the development of our future (U11 - U19). On July of 2002, VP Mark Robinson stepped down, and the Board elected to have three (3) new Vice Presidents to help with the rapid growth of the league. Roger Thomas, Nawapan Smith and Isaac Holbron were the three (3) selected. However, by 2004, Thomas remained as the only dedicated Vice President. After almost a decade of service, Thomas decided to step down in late 2011. The Board then appointed long standing Director Deyn Saito and Sean Richardson as the new Vice Presidents. In September of 2006, MISO introduced another division, the M35+, which is for players 35 years of age and older. With this new division, MISO now covers competition for just about all ages, as the youngest registered player is 10 years old while the eldest is in the upper 60’s. In March of 2008, MISO broke the gender barrier to create the W1 Division. This Division is geared towards the competitive women on the island, with the focus on developing the future of the women's game. This Division is mainly composed of young women preparing themselves for their move to the collegiate or Pro level as well as those returning from college or National leagues. Plans are in the works for a Seniors Division, which will be geared towards players 55+, as the competition level of the Masters Division has drastically increased in the past couple of years, making it hard for many 55+ players to keep up with the level of play. This Division will most likely consist of teams playing with only 7 or 8 players on a reduced field. On February 12, 2013, MISO had the distinct honor of having US Club Soccer (USCS) designate the MISO Junior League (MJL) as one of the initial group of eight Leagues from across the country to form part of a Premier Leagues platform.